After making her big screen debut in last year’s Batman v Superman: Dawn of Justice, superheroine Wonder Woman will finally get a movie of her own. Tying in to the highly anticipated film, a homegrown marketing effort is rolling out Wonder Woman-centric accessories, apparel and food. F*** was at the DC Super Heroes Café in the Shoppes at Marina Bay Sands, Singapore, for the product launch on 4th May. Irwan Sukarman, creative director of JT Network, presented the Wonder Woman product line that will be hitting the shelves of DC Comics Super Heroes fashion and lifestyle stores in late May. JT Network owns the retail stores and the café, under license from Warner Bros. Consumer Products. Sukarman stated that the design principle boiled down to the three elements of “mythology, metal and strength,” to convey the “fierce grace” which is central to the Wonder Woman character. The items include tops for men, women and children, coasters, headphones, iPhone cases and bangles. The product design competition WeDesign has partnered with DC Comics Super Heroes stores and Vendermac Distribution, theming this year’s contest to Wonder Woman. On 20th May 2017, the atrium at Bugis+ mall will host a design marathon where 120 designers will work on a given Wonder Woman-themed design challenge over a 4-hour period. The top five entries will win cash prizes, movie premiere tickets and limited edition collectibles. The winners will undergo the process of turning their designs into an actual product collection to be launched in the market. Head project manager Lee Kwan Ter unveiled Vendermac’s range of clutches, sling bags, keychains, pouches and laptop sleeves, which feature washed faux-leather and brushed metal details. Chef Martin Woo explained his inspirations behind the special menu. Last year, the café also had tie-in dishes in the run-up to promote Batman v Superman and Suicide Squad. 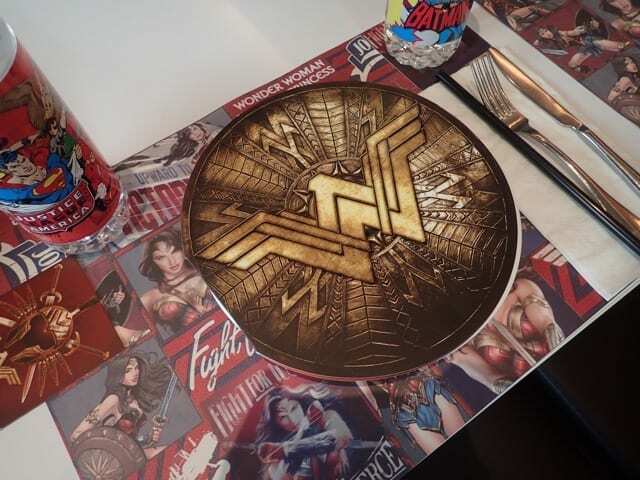 The Wonder Woman menu card itself is shaped like the titular character’s shield. Chef Woo stated that the governing theme in devising the menu was that of empowerment and vitality, and he wanted to emphasise the organic nature of Wonder Woman’s home, the paradise island of Themyscira. First up was Themyscira: My Salad Origin ($16.90), which comprises cabbage, purple cabbage, green papaya, beetroot, cherry tomato, baby red radish, sliced carrot, sesame seeds and sweet corn in a creamy sesame dressing. This was largely unremarkable, and not unlike a salad one could whip up at home. The beetroot, cut into star shapes, was the most unique element of the dish. Chef Woo explained that to remove the earthy, astringent taste of the vegetable, the beetroot was wrapped in wet dough and baked before being sliced into shapes. Our second course was Paradise Island Mac and Cheese ($18.90), inspired by the scene in the trailer in which Wonder Woman dives off a cliff into the ocean. The baked pasta dish comprises Conchiglie Rigate (shell-shaped pasta), a five-cheese and mentaiko (smoked cod roe cream) sauce, with prawns, white button mushrooms, turkey bacon and garlic. While we counted only two prawns in the whole dish, it tasted pleasant enough. Macaroni and Cheese is a go-to comfort food for this reviewer, and he was satisfied. Then came the Truth and Beauty mini burgers ($22). It’s not sure whether Truth was chicken and Beauty was beef, or the other way around. The beef burger had a filling of ribeye steak, shitake mushroom, purple Spanish onion and cabbage, while the chicken burger had a chicken patty stuffed with cheddar and smoked mozzarella cheese, an onion ring, pineapple salsa, peanut butter, cabbage and a sunny-side up quail egg. The yellow bun was coloured with turmeric, and the pink with beetroot juice. The chicken slider was similar to the Superman-themed burger from the Batman v Superman menu last year, which also used peanut butter. The chicken patty was standard, ho-hum stuff. The beef slider fared significantly better, with the ribeye steak slices being remarkably tender and tasty. For dessert, we had the Shields of Truth pancakes ($15.90). Each pancake was emblazoned with the Wonder Woman ‘W’ insignia, and they were served with strawberries, blueberries, kiwi, strawberry ice cream and a whipped cream topping. The pancakes themselves were sufficiently moist and dense, but the ice cream seemed awfully cheap, as if it was from a supermarket home brand. To complement the meal, we had the optimistically-named Wonder Woman’s Box Office Power drink ($10.90), which came in a glass styled to resemble the character’s armoured bustier. An ice-blended salted caramel popcorn-flavoured drink, this was a dessert in a cup – i.e., really sweet. As a DC fan, this writer always enjoys visiting the café, but just as we’ve said in our previous reviews of their themed menus, the food is akin to what would find in a theme park – in terms of both quality and price. It was a surprise that no Greek-themed dishes were showcased, seeing as Wonder Woman draws heavy inspiration from Greek mythology, and that seemed like an obvious direction to go in. Wonder Woman opens in cinemas on 1st June 2017.